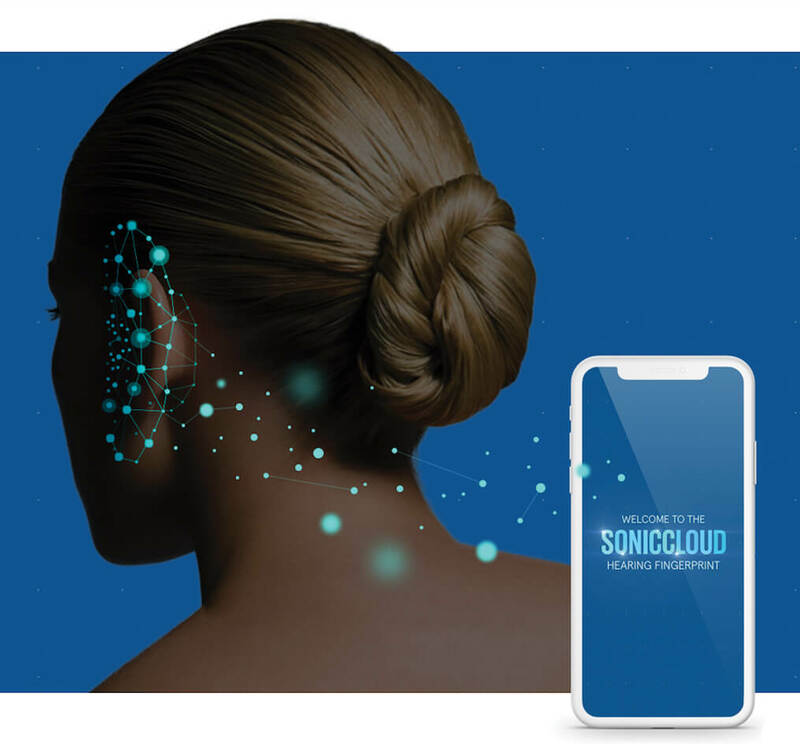 At SonicCloud, we’ve worked with world class experts in digital signal processing, auditory neuroscience, and hearing loss to develop a breakthrough solution that automatically enhances the way you hear. 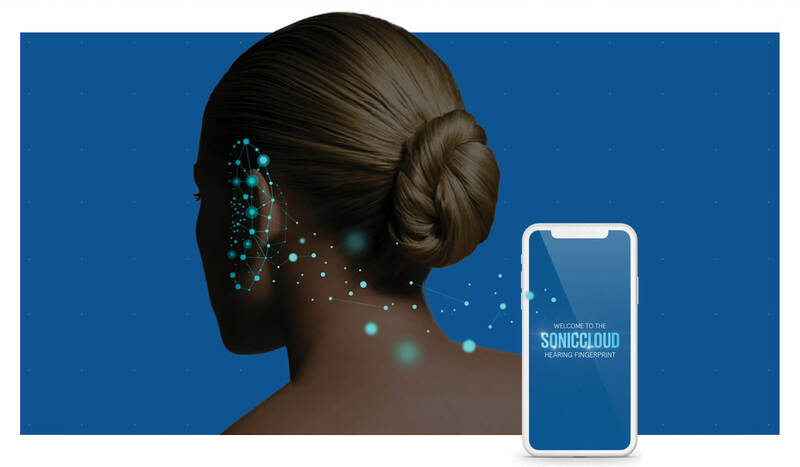 “ SonicCloud’s Hearing Assessment is better than any other internet hearing test out there. I was shocked at how accurate the audiometric configuration is. With SonicCloud Streaming I was hearing background vocals in a Beatles song that I’ve never heard before. And I’m a huge Beatles fan. What is the underlying science that makes SonicCloud’s algorithm so revolutionary? SonicCloud’s DSP algorithms are designed especially to target speech understanding and clarity. They are arranged in a unique structure, leveraging an unprecedented range of parameters for better hearing comprehension. In fact, our sound processing is held to a higher standard of fidelity than what is typical for mobile applications (phone apps), more closely resembling the quality found in professional music production! Unlike music, however, real-time hearing enhancement is a far more demanding problem. Why? Because hearing involves psychoacoustic effects that unimpaired listeners simply never encounter (for example, overlapping effects of “comb filtering;” sensitivity to loud sounds at certain frequencies). As a result, this added complexity requires special engineering attention from the ground up; rather than “off-the-shelf” solutions. We’ve found that corner-cutting strategies are detrimental to the user experience. Our DSP engineering decisions have always been informed by dedicated, results-oriented experimentation without a reliance on preconceived methods. Furthermore, due to our innovative paradigm, we have can deploy our DSP algorithms on virtually any platform — from iPhone to Laptop to over-the-web Audio — with minimal changes while maintaining a high level of performance. Deep domain knowledge accrued over much time and exploration has allowed us to “rethink self-fitting methodology” from the ground up. With the help of leading university researchers, world class DSP engineers, and a maverick board of audiology expert advisors, we have developed a truly innovative filter bank design that cannot be easily reproduced. Since SonicCloud was founded, we’ve logged hundreds of hours in focus groups with subjects encompassing virtually all types of hearing loss. Any time a subject has a technical or a tuning issue, we set up an expert tuning session with that person to address his or her specific hearing needs. Then, we apply what we’ve learned to any other subjects who may have a related issue. The net result is that we are always improving our product. You can clearly see the efficacy of our technology as demonstrated in surveys, testimonials, and focus group results that indicate significant improvement in speech understanding and naturalistic quality of sound on phone calls. Our self-tuning methodology covers 3 levels of optimization: Mechanical, Neural and Situational Tuning. Using this groundbreaking tiered methodology and the attendant proprietary technology, the user can converge on a precisely-tuned hearing profile without any expertise whatsoever. The baseline hearing assessment finds your minimum threshold and loudness tolerances at each frequency. The results go down to 1 dB level of granularity. This methodology not only contributes to better speech understanding, but also mitigates “phantom” audio effects. Deploying compression threshold values that are more precisely tied to loudness discomfort and thus audible dynamic range. Optimizing time-domain parameters which exert further impact on speech discrimination. Employing a unique and proprietary clipping mitigation strategy, based on deep domain knowledge, that allows us to push the limits of enhancement without leading to undesirable processing artifacts. Empowering users to adjust these parameters themselves — in the comfort of their home — via our highly intuitive and accurate user interface. Once the baseline hearing assessment is complete, the user will have created a default hearing profile that will sound great in the vast majority of situations. Two people who present with the exact same audiogram mechanically may nonetheless have very different speech understanding capabilities, based on for example, how long they’ve had the hearing loss and how well their brains have adapted to it. Optimizing for brain differences can be a crucial factor for achieving good speech understanding. Our patented, innovative, interactive optimization accounts for the neural differences by giving the user, who is the only one who can truly perceive what’s going inside his/her brain, the ability to iteratively hone in on the perfect presentation level for key phonemes, by providing audible context of those phonemes. 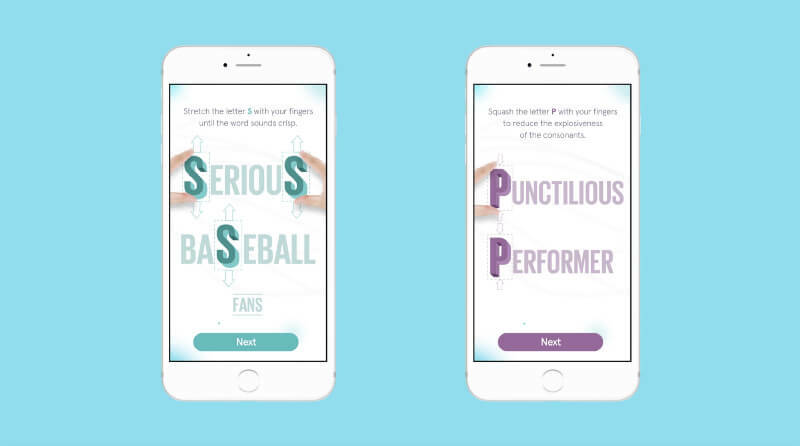 Here’s how it works: A phrase or word is played back on the phone while you optimize interactively — adjusting letters or phonemes important for understanding by stretching or shrinking them until they sound perfectly clear. Working through a range of representative phonemes, you can cover the key parts of speech and voila! You’ll have an accurate profile ready for use. Audiologists have praised our self-tuning methodology, as it allows users to achieve sophisticated contextual tuning — using easily understood visual metaphors — in a way that is not possible with other methods. Not all voices and environments are created equal. So while your default profile will work great in most situations, it might not be optimal for when, say, you’re talking to your niece whose voice has a very high fundamental frequency, or when your friend is in a noisy restaurant with lots of chatter. That’s where the situational tuning component comes into play. The interface is intuitive — for example, if the audio sounds too tinny to you, simply tap on the ‘too tinny” mini-tutorial to guide you through how to make an appropriate correction on your “hearing curve.” The same goes for other acoustically challenging situations or voices. Once you’ve made the necessary adjustments to account for that particular voice or environment, simply save that profile. Next time you’re talking to that same person or find your friend in that same environment, your profile is ready to use! So, what level of improvement can you expect to hear? Pretty amazing! Ready to hear the incredible difference for yourself…? 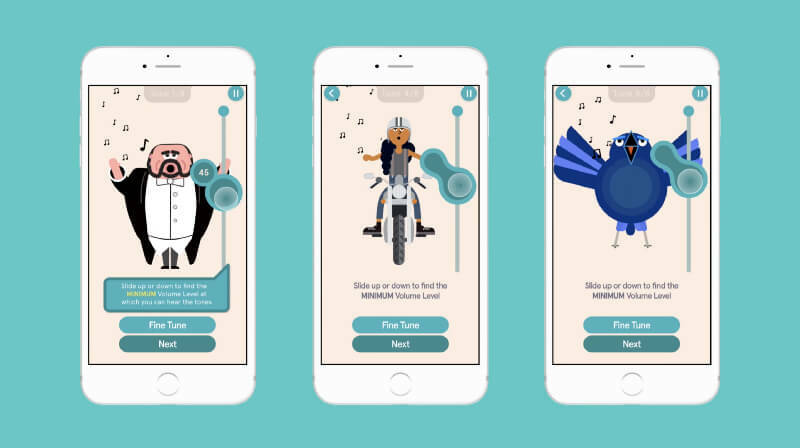 Download the app and take our free hearing assessment to get started!